Tabriz is a large and active city on the Sahand range, which is located at an altitude of 1,000 meters and leads to Lake Urmia. The strategic location of this city that runs through Tehran, Istanbul and the Trabzons port of Turkey, making it one of the most important commercial centers of Iran. This area is well weathered, with moderate summers and cold winters. This area is an earthquake-stricken area and has been destroyed five times by the earthquake. The city of Tabriz has its ancient origins: it is mentioned in Assyrian sources, while the people believed it was built in 791 A.D by the caliph’s wife Harun al-Rasheed who tended to have a new city with a pleasant weather. At the time of Arab Caliphate, this city played a significant role and during the Seljuk Turks and Mongols period it was chosen as the capital of the government. At that time, mosque and magnificent buildings were built in the city, including the Kabood mosque which is also artistically important. This mosque had had a valuable library and a famous painting school. As the beginning of the 16th century Tabriz was chosen as the first capital of the Safavids. In the long period of conflict with the Ottomans, this city was a place of tension and it has intervened in the attempts of the northern provinces of Iran to join Russia from the late 18th to the early 20th. Accidents and wars didn’t cause Tabriz to lose its important role in business: Due to its neighboring with Turkish ports especially Trabzon, to European traders, it has always been considered an important city and they considered Tabriz as an important center for the production of handmade rugs. Rug weaving in this city has an ancient background and a long history. This city has been one of the main centers of rug weaving in the Safavid era. 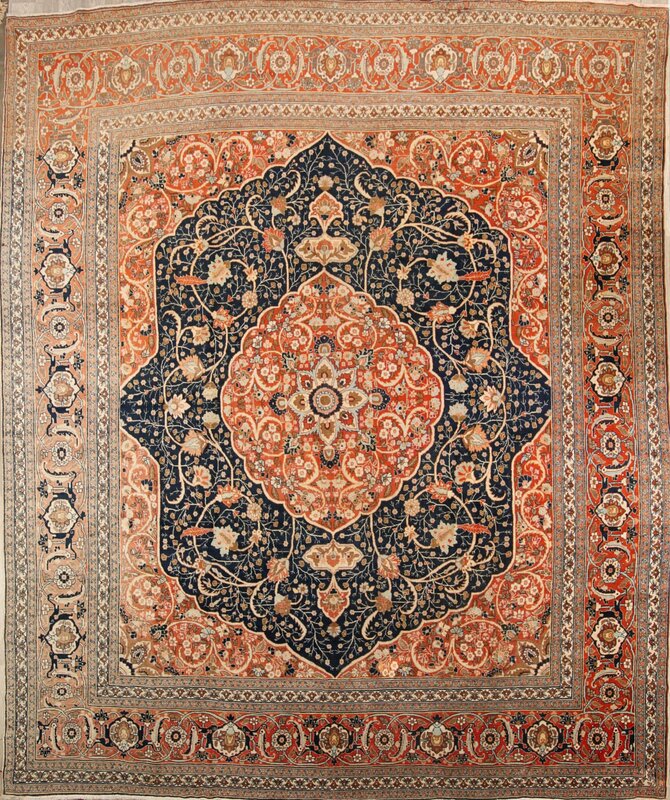 In subsequent periods, the demand of European companies operating in Tabriz also showed that rug weaving in high quality and special designs and styles has been widely common in Tabriz. 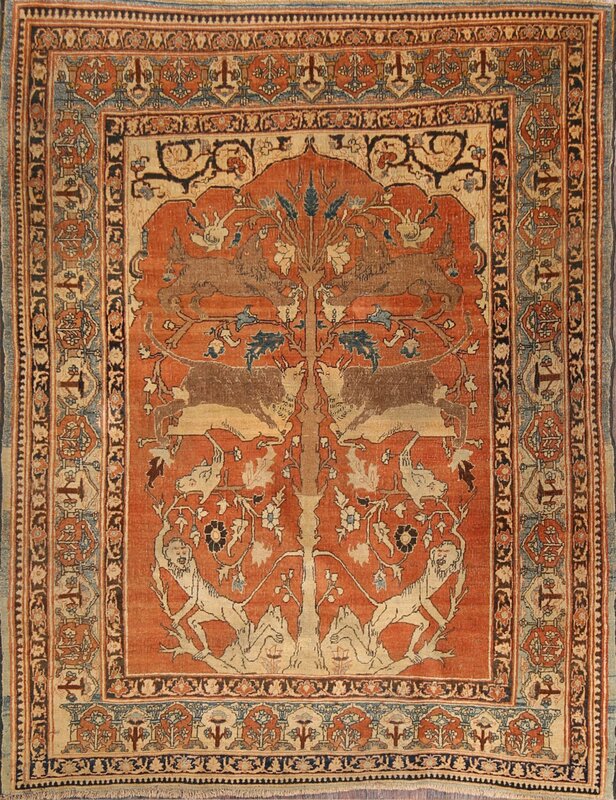 In Tabriz Ziegler Company and an important German company Persiche Teppiche Aktien GeSellschaft had branches in the field of rug weaving known as Petag, which were often adorned with classic designs. Tabriz Rugs had a special elegance in the 19th century, and, alongside inspiration from traditional Iranian designs, they also used innovative designs. 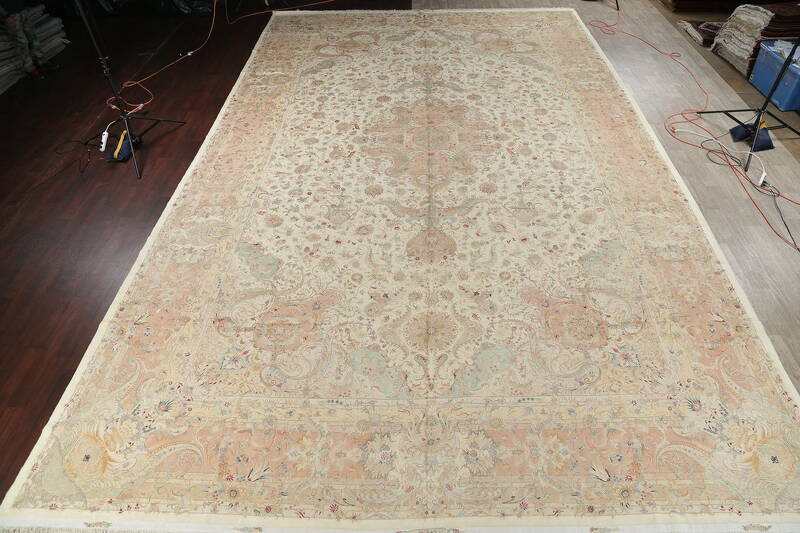 They were very careful in choosing the raw materials and its quality for Tabriz rugs. These rugs are woven with symmetrical knots and often are made of cotton warp which is very compressed to the point that the back of the rug is prominent. Warps are composed of two or sometimes three strands of twisted array like (Z2S or Z3S). Occasionally, there are rugs which have silk fibers and are often colorful: in this case, these rugs are called seven-color in local dialect. The weft goes through the knots twice, in the first row the weft is made of a strong and stretched cotton yarn which compresses the warp. The second weft is thin and loose and it is made of a delicate cotton yarn which is usually azure or pink. In classic Tabriz rugs, woolen or silk wefts are rarely seen. Tabrizi weavers are among the fastest and most skilled weavers throughout Iran; traditionally, they have a hook to creak knots in their rugs, which also has a blade to cut the knots. With this method, a weaver can do up to 12,000 knots per day, counting the time it takes to pass the wefts through warps twice. In Tabriz, the elegance of rugs is defined by the ridge: Each ridge is a unit with a length of about 7 centimeters. There can be 25 to 70 knots in a ridge. The elegance and the ridge count of Tabriz rugs is very different and the ridge count of 25, 35 and 40 can be seen from the old samples to the present. But ridge counts such as 50, which are more popular nowadays, are commonly used for export-oriented rugs and in this group ridge count of 60 and 70 are also seen. The excellent quality of Tabriz rugs is not only sue to the technical ability of the weavers, but also because of the possession of high quality raw materials, especially local wool, that was gotten from sheep which were bred in the mountainous region of Maku in the northwest of the province near the Turkey’s border and was often used for rug weaving but today, this process has changed a lot, the use of imported wool and spinning machine has greatly influenced the quality of this rug, especially in color shades that are effected by the raw materials. In Maku region, sheep’s wool is sheared twice a year. Spring shearing is happened in March, and an exceptionally elegant wool named Kuzen juni Pashmy comes from the first shearing and it’s as delicate as Kashmir fiber. The strength of the used strands and the weft weaving method (Lool Baaf) caused Tabriz rugs to be durable and compact and feel a bit rough when touched. Among the woven rugs in Tabriz from the mid-nineteenth century to the first years of the twentieth century, there are countless silk samples which are rivals of the handmade rugs in Istanbul and Hereke. In these rugs which are weaved so accurately and nicely, sometimes traditional medallion designs and sometimes various and fresh designs are utilized, and their tissue is often special for oversea markets. 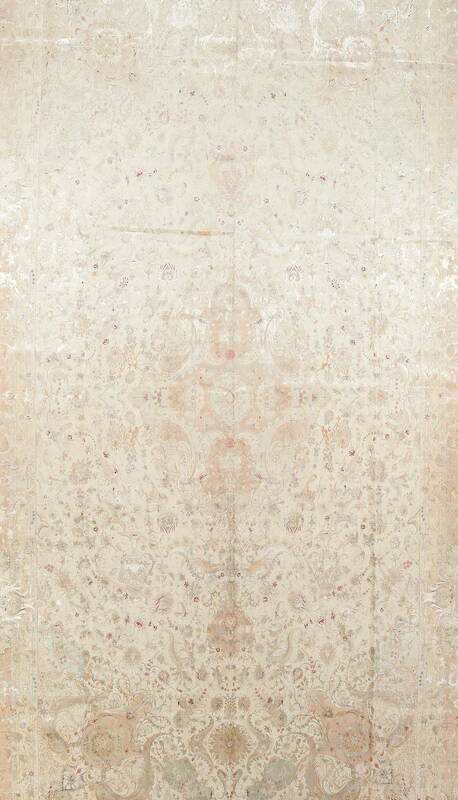 In the last decades, some inexpensive materials like tanning wool, which originate from sheep, were used in Tabriz rugs. In some cases, the double knots are used. Sometimes you see a pair of similar rugs on a Tabriz loom and this causes a side of the rug undergo the binding process after the weaving ends. The dimension of these rugs are so much various ranging from small to large size, even there are some extra-large rugs. Sometimes, some long rugs are weaved called running ones which are set on lateral sides of rugs and covers the floor. On superior part, another rug used to be weaved called “Kalagi” whose length was 2 t 3 folds of the width and lateral dimensions have 1-meter width and 3 or 4 meters length. The dimensions of the “Kalagi” is usually 4*1.5 or 4*2 m. once the coloring was totally botanical, but nowadays we use synthetic industrial colors. A major feature of Tabriz rugs that have natural color and belongs to last century, is less brightness of the piles, which is probably because of the water effect and great deal of alkyne in the dyeing process. The used schemes as before mentioned, are so various as “Janamazi” and “Tarhe Baqi” rugs were observed among classic medallion and corner designs and vase schemes in Safavid era. The rugs decorated by subtle and detailed “Harati” designs, are observed as well that these small designs cover all the background. In Tabriz handmade rugs, the traditional tissue of illustrated rugs decorated by hunting scenes are so much common that are similar to Safavid era’s rugs. In opting the margins, the “Harati” or palmette flower designs were common, which once used to be called as ” samovar ” or “turtle” designs. Also, cloudy designs margins and some epigraph schemes of poem-like scripts or phrases of quran were commonly used. Among Tabriz rugs, you can notice “Haji Jalili” which is named of the weaver master “Haj jalil Marandi” who lived in the late 19th century n Marand and his masterpieces are retained in some museum in 50s, an important workshop in Tabriz was managed by Tabatabai whose rug’s feature was the prompting the weaving by using a small technical modification. The second weftwhich was loose and azure wouldn’t cross each knot wate but would cross each 10 or 30 wates, thereby the rugs were compact but no too much heavy. Other famous Tabriz rugs are namely “faraji”,”Sedqiani” and “Alabaf”. Tabriz rug is a type of general category of Iranian carpets from the city of Tabriz, which is located in the north-west and has been at the centre of the rug making world of hundreds or even thousands of years. 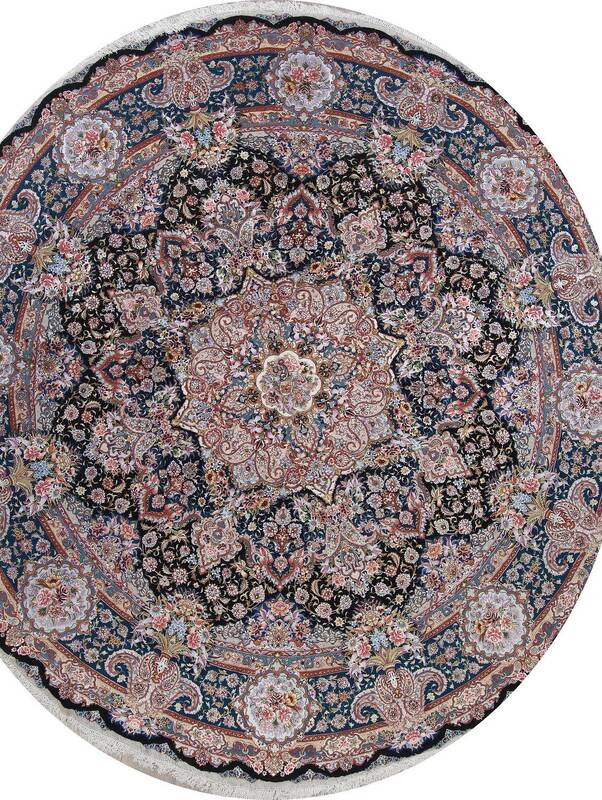 Due to the particular size in this industry the design and quality varies in Tabriz. Tabriz rugs can be found in limitless designs from medallion to figural, Mahi, Herati, pictorial and also in 3-d shaped too. Different types of rugs also made here including flat weave or pile, simple as well as complex composition.